Married Ann Alder in St Nicholas, Witham, Essex. This and the Will of his sister Sense Drewry creates a link to the Lincolnshire Drewrys (see also the William of Ulceby document in The Box). Samuel was a gentleman, an 'esquire' in the class system of his age, and died a wealthy man. He had offices in the heart of London, in Whitehall, just across from the Admiralty. Nowadays, he would be a top civil servant; then he was a member of the Commissary with equivalent army rank, handling Army accounts. "Paymaster of HM Forces" - by Mike Chrimes in the Biographical Dictionary of Civil Engineers where he describes Charles Stewart Drewry as "the son of Samuel Drewry, Paymaster of HM Forces". "Superintendent in the Paymaster's Office" - the description of William Tillotson Drewry's father in William's Service Record in 1811. In 1777 Samuel is in Canada, aged 19/20. He appears in The Parliamentary Register, 1778: which records that, in December, 1777, Samuel Drewry was "Attending the Army in Canada as Assistant Commissary, at Sorel". 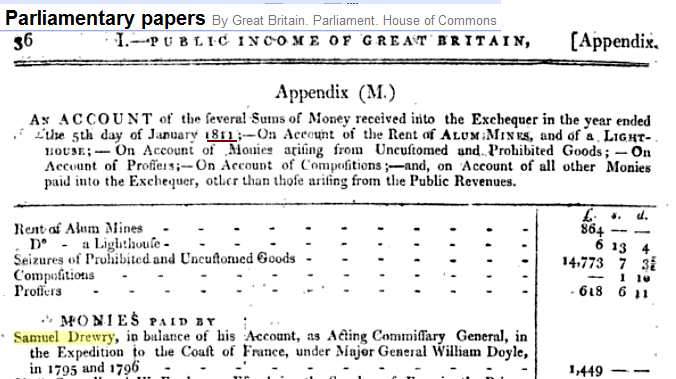 In 1786 – 93 He is working for Mr Adair, Paymaster of the Artillery – based in London. 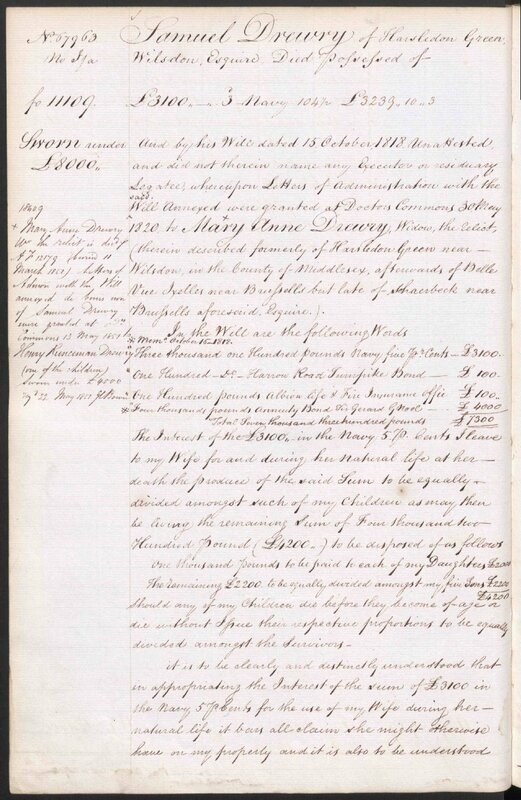 The Poll-Book of 1790 records: 'Drewry Samuel, Army-Agent, Mary-le-bone Road, London'. "On the 8th instant, Mr. Samuel Drewry, of Lincoln, to Miss Alder, of Watham, near Colchester.". The newspaper reports say that the marriage took place on the 8th August and the lady was from Watham/Witham. 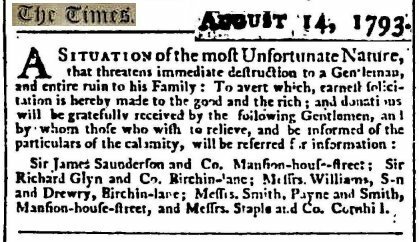 Ninth August, 1789, by licence. The record of his marriage shows him as "Samuel Drewry of Westminster". It would seem that Samuel sees himself as a Londoner – he has been living in London for at least three years; but that in respect of 'Society' (i.e. in the journals above) he is "Samuel Drewry of Lincoln." Traditionally at that time marriages took place where the bride lived. So Samuel married his Essex girl in Witham. Both parties signed their names and the witnesses were Thomas Allen (Ann's step-father or brother) and William Constable. In March 1804, the birth of Thomas Allen Drewry (named for the Thomas Allen above) is recorded at St Mary's, Willesden. 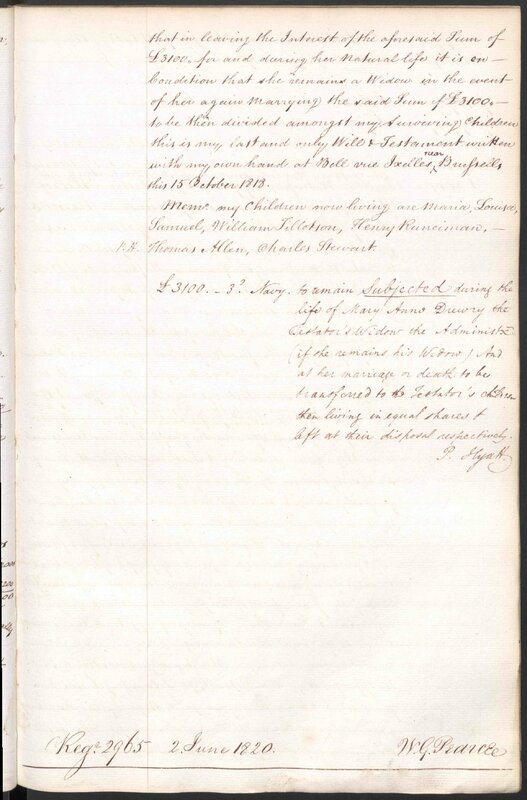 In October, 1804, the death and burial of 'Ann Drewry', aged 38, is recorded at St Mary's, Willesden. The birth of Thomas followed seven months later by the death of Ann could suggest that Ann died of complications after giving birth to Thomas. The Ann who died in 1804 is Samuel's first wife and the mother of all of Charles Stewart's siblings. In November,1804 Samuel married Mary Ann Stewart. In the Pallots entry Samuel is shown as a widower. Samuel, at the age of 47, found himself with six children - between the ages of a few months and 11 years - and without a wife. Samuel's marriage to Mary Ann Stewart, one month after his wife's death, must have been arranged quite quickly, though it could be that Ann's death had been expected for some months. The witnesses in the marriage to Mary Ann seem to be 'professionals'. They appear as witnesses in a number of the other marriages on the page. Mary Ann appears to have come from a family with which the Drewry's had close connections. Samuel's only son by this, his last marriage, was Charles Stewart Drewry our direct forebear. The name 'Stewart' was often used in later generations as a middle name, even when not recorded as such in birth certificates. The use of the middle-name 'Stewart' has continued even to this day. There are dates recorded in the Wood Collection, in Brent Archives, showing Drewrys in Harlesden in 1760, 1765, 1800, and 1803. From 1802 there are references to Samuel, starting with the birth of Louisa. It seems clear that he had a connection with Harlesden if not a home there from at least 1802. The birth of his son Thomas Allen is recorded in St Mary's, Willesden in 1804. Samuel's son William T. has Harlesden as his home address in his application to join the Hon. East India Company in 1811. A house at "Holsdon Green in parish of Wilsden" is part of Samuel's bequests in his will. Samuel was not continually resident in Harlesden. He has homes in London. His son Charles is educated at the Brussels Lycee. Samuel had at least one house in Belgium, and he died there. On the 5th July 1815, Samuel senior wrote to Samuel, junior. He mentions the "late glorious Battle on the Frontiers of France" (Waterloo). He discusses his desire to buy a house in France (he eventually purchases a house in Belgium - until 1830 a part of France). and mentions the loss in battle (at Waterloo) of a close friend's son (Lieutenant William Livingstone Robe). There are documents in the Wood Collection showing property dealings with the land owner Sir William Glynn who is a leading banker in the City of London at that time. "1754-1970 - Founded by three City gentlemen, Joseph Vere, Richard Glyn, and Thomas Hallifax.. By 1800 the bank had moved to Birchin Lane." "So far back as 1793 in the 'List of Bankers' we find 'Williams, Son & Drury, 20 Birchin Lane,' and this firm appeared in the 'Directory' for 1779 as 'Lowe, Vere, Williams & Jennings', of 20 Birchin Lane." Death At Brussels: Samuel Drewry Esq., late of Horlesden green in the County of Middlesex, in the 63rd year of his age. Samuel left at least £7,300 (perhaps the equivalent of close on £1m in 2009) as well as the house in Harlesden. There are also references to a house in Brussels at "Belle Vue, Ixelles nr Brussels" and later at Soliasbord (?) near Brussels). Samuel left a number bequests but mainly to his wife Mary Ann - as long as she remains a widow(!) - and to his children: Samuel, William Tillotson, Maria, Henry Runciman, Charles Stewart, Thomas Allen, and Louisa. Unfortunately there is no reference to any other family member in the Will. Apart from sums of money, his properties, and his furniture and wine, the only items mentioned in the will are musical instruments; a pianoforte and violoncello, and a flute belonging to his son Charles. 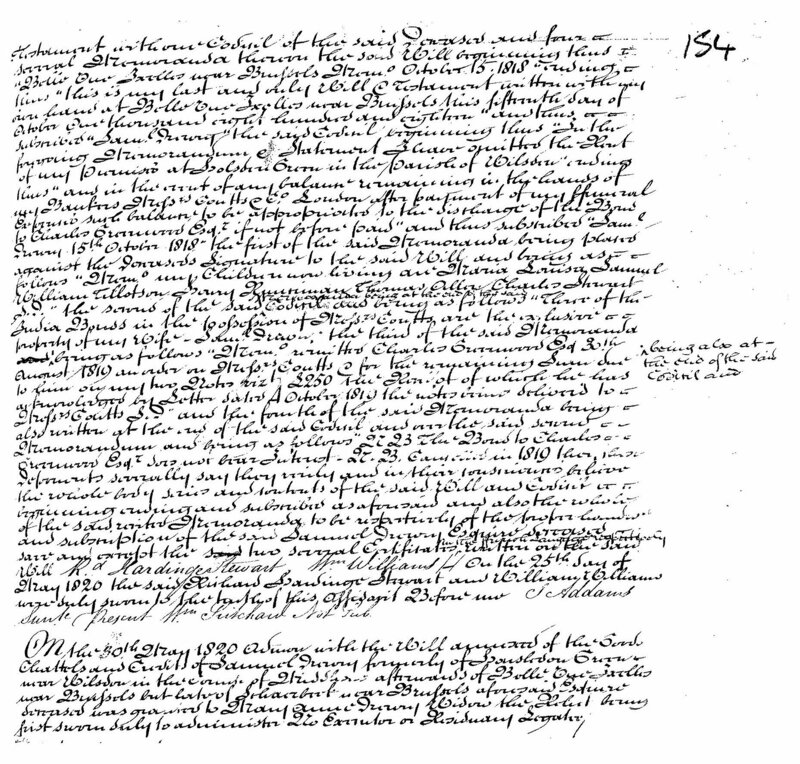 Transcription of Samuel's Will - courtesy of Malcolm Easton. 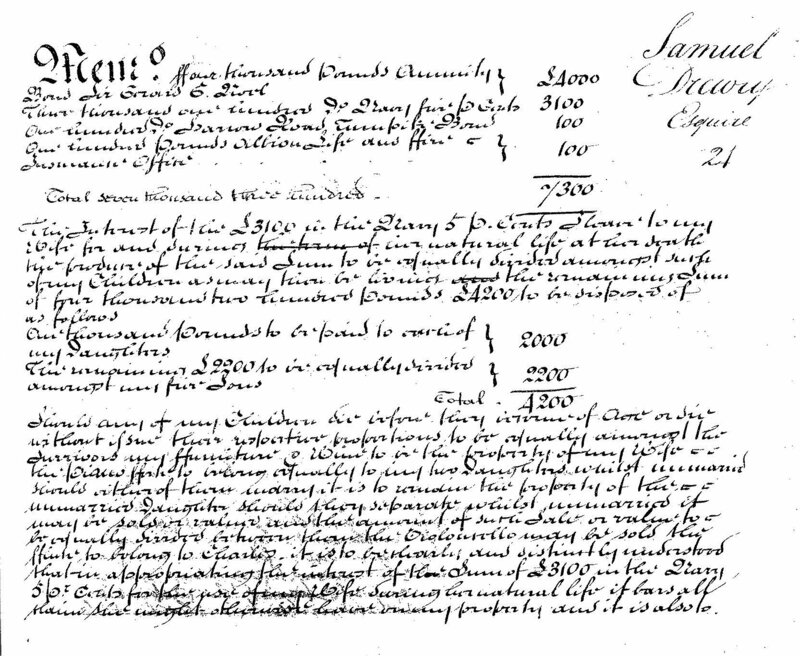 In 1777 Samuel was an Assistant Commissary in Canada with the Commissary General Nathaniel Day. before serving as a Commissary in the 'French Revolutionary Wars' (1793 - 1802). In 1790 Samuel is recorded as an Army-Agent. In 1793, on the 19th November, Samuel was commissioned as a Deputy Commissaries General. 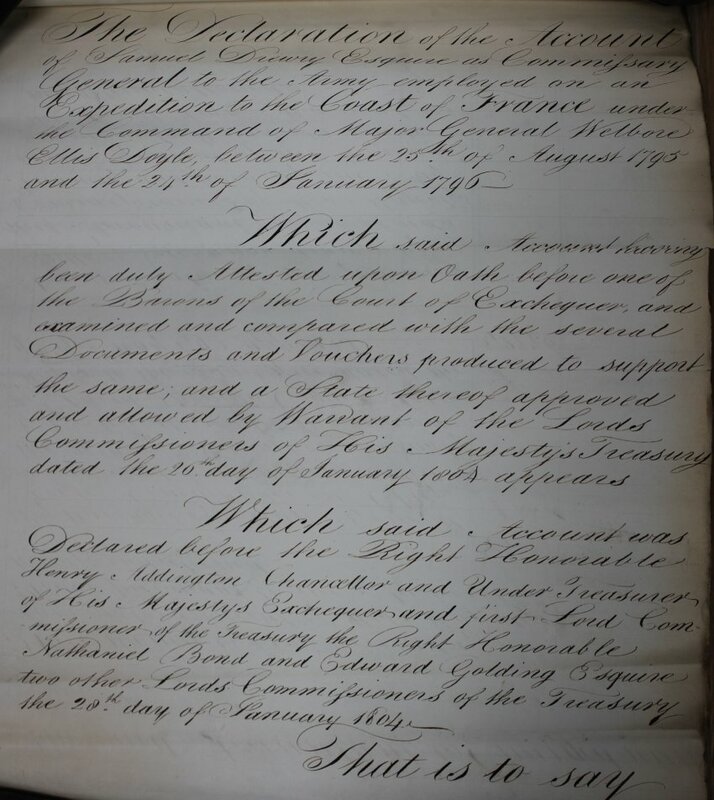 House of Lords documents in 1796 describe Samuel as both Deputy Commissary and Commissary-General to Major-General Doyle in the failed invasion of France in 1795. See The Earl of moira's Expedition below. 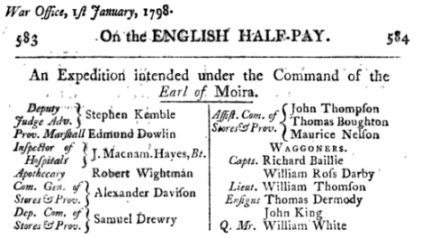 The	Army List, 1798, shows Drewry, Samuel in the list of 'Officers of The Land Forces and Marines on the English Half-Pay'. The same entry appears in the 1800 and 1802 Army Lists. Does this suggest that while Samuel was involved in the organisation and planning of this Moira expedition he was being paid half his salary through the Army and the other half via the War Office? The English "half-pay" system was a sort of retirement plan for military personnel "in which retired, disabled or otherwise unemployed officers received roughly fifty percent of their base pay." Samuel appears to be on 'Half Pay' for the next 20 years and still working. 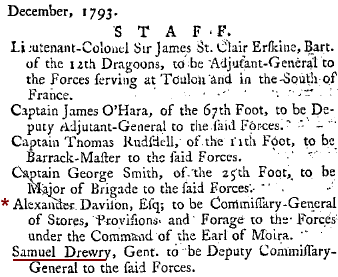 For example, the 1815 Army List also shows Samuel Drewry on half pay in the Commissariat Department. The Commissariat Department were essentially civilians and Samuel's 'commission' was, I guess, a device to allow him to work within the army and give him some sort of status in respect of rank. Craigs Court can be found in a 1799 map of London next door to Greater Scotland Yard, just across the road (White Hall) from the Admiralty. The Paymaster-General’s Office at that time was 200 yards away, at 36 Whitehall - between the Admiralty building and The Horse Guards. The Court is clearly a prestigious set of buildings situated in the heart of the city. One of the principal tenants at Craig’s Court in the early 1800’s were the "Agents for the Army, Messrs Greenwood & Cox at Nos. 1 & 2 Craig's Court, Charing Cross". The British Army and Navy were examined in detail in the early 19th century and systematically reorganised, partly, one imagines, as a result of the defeat in the American War of Independence and partly because of the problems across the Channel in France. Eventually the Honorable East India Company's army would be absorbed into the British Army. 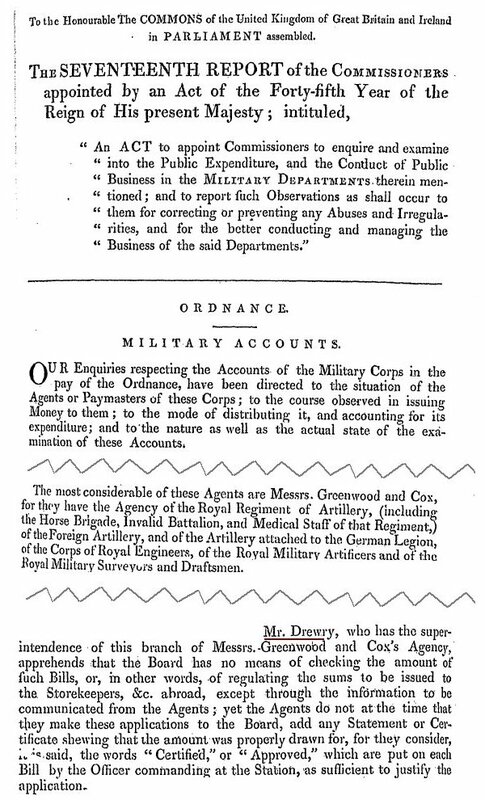 Naturally, military finances were a prime target for investigation, and in 1810, Samuel was called before a parliamentary committee to provide information about payments to the Army. an overview of Samuel's testimony. "In 1776 an American army under Benedict Arnold had invaded Canada, intending to drive the British out of Quebec and welcome Canada as the Fourteenth Colony" (The War for America). The invasion was not successful. In May 1776, the Americans still held Sorel. In June, a strong British force took the town. "In early June 1777 the British army was assembled at the north end of Lake Champlain, advanced and took Forts Ticonderoga and Crown Point without any difficulty, and then attempted to push through to the Hudson River at Albany. The hundred miles or so separating these two places was the watershed of the Sorel and Hudson river systems, heavily wooded and with a series of hill ridges running parallel to the line of march. Towards the end of July the American resistance began to stiffen" (The War for America). Sorel, in 1777, appears to be a major British Army encampment. Burgoyne had an army of 10,000 in the area. 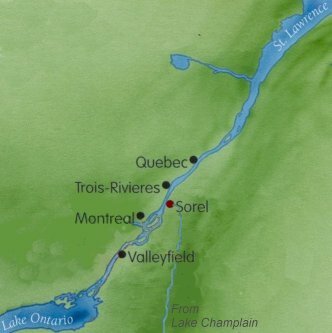 While Sorel itself was little more than a village it must have been a strategic place for landing troops and material. Burgoyne took his army south earlier in 1777. The soldiers captured by the Americans in the Saratoga battles were released and returned to Sorel in 1780 and 1781. 1777 is effectively the end of the American Revolution, though the war does not formally finish until the Treaty of Paris in 1783. We do not know whether Samuel was already in Sorel in December 1777. Perhaps he arrived then to replace some of the staff who went with Fleetwood Parkhurst, Deputy Commissary General for Sorel, who "accompanied Burgoyne on his march southward". (See e.g. With Musket and Tomahawk: The Saratoga Campaign and the Wilderness War Of 1777). We do not know how long Samuel stayed in Sorel. 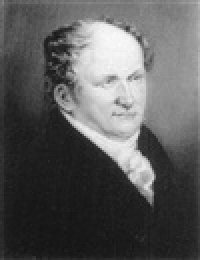 Samuel died in Brussels in Brussels in 1820. Samuel's son Charles Stewart is reported to have been educated at the Brussels Lycee. This suggests that the family spent some time in Brussels. Five years before Samuel's death, Napoleon was defeated near a village called Waterloo, 9 miles south of Brussels (1815). My guess is that the army headquarters were in Brussels and Samuel was stationed there. Each regiment had its own paymaster but I believe Samuel was not attached to a regiment, rather that he was in a supervisory role working directly for the War Office. Earl Moira became commander-in-chief in Scotland in 1803; and was Master of Ordnance in 1806-07. Earl Moira was Governor-General of Bengal from 1813 to 1822. He became Marquis of Hastings in 1817. "Over the years Davison benefited from his relationship with Nelson and amassed a good fortune... In 1802, he tried to bribe voters in an attempt to win a seat in Parliament. In 1804, at the age of 54, he was sentenced to a year in prison for the crime. And in 1808, he was convicted of fraud, in connection with his role as a purveyor of supplies to the British Army, and served another term." (Source.) See also WikiSource 'National Biography'. The scroll containing Samuel's accounts for the expedition is in the National Archives and is a long document written in a fine hand. 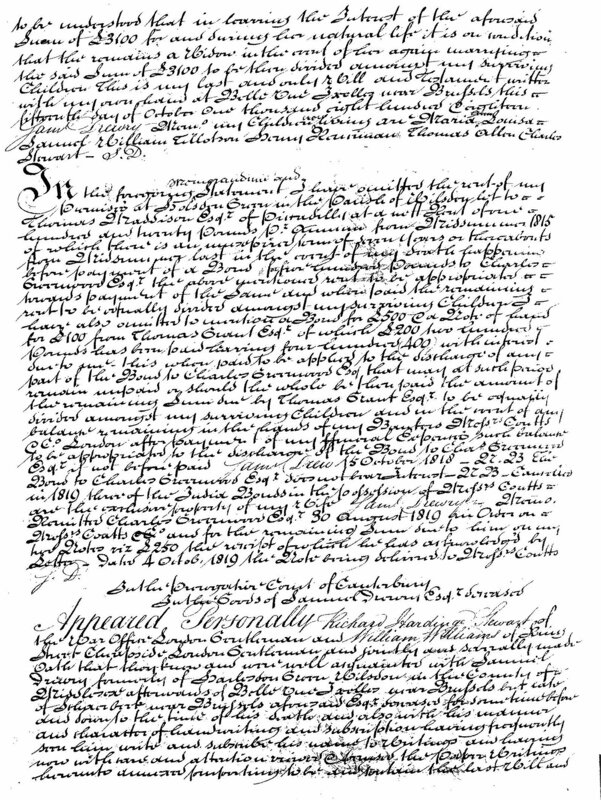 See for example the start of the document. The Account is rather long and boring, made up initially of entries along the lines of: "One Bill payable to ... dated the ..." and "One like Bill payable to ... dated the ...". But there are some interesting items. Samuel's wages for example. Samuel claims for 189 days at £5 per day, a total of £945. The "Amount paid sundry Persons for Horses lost on the Expedition" is £3,374.10.0 (a lot more than a quarter of a million pounds and perhaps as much as three million pounds today). There seem to have been problems. A further £2,950.13.2 is given to Warren's Corps of Hussars as "Pay and Losses of Horses and Baggage". Overall, it seems clear that Samuel was responsible for large sums of money. From the parliamentary register Consolidated Fund in the Quarter ending 5th July: "Imprest money re-paid by SamuelDrewry efquire commiffary at L' lfle Dieu £1,000"
From the parliamentary register : By Samuel Drewry deputy commiffary to the army under the command of General Doyle at 30 days fight £16,930. From the parliamentary register - April 8th (1797)- To bills of exchange drawn by S Drewry commiffary general of the forces under the command of general Doyle for public services £16,930. The above parliamentary finances refer to an incident when the English failed to adequately support an 'uprising' against Napoleon - part of an attempt to support Royalists who wanted to install Louis XVIII as king of France. "The Military General Service medal was awarded for services during the Napoleonic Wars 1801-14 However it was only sanctioned in 1847, and issued in 1848, more than 30 years after the war. The MGS was only issued to those still alive who claimed. - Samuel was not alive in 1847. IGI shows a William Drewry born 22/9/1771 in Beaconsfield, Bucks. Another possible relation to Samuel? William's father is shown as William Drewry and Sarah. Wm Drury married Mary White in Long Crendon in 1747. Long Crendon was a small village in the 1800s, about 900 people. IGI records have a Samuel Drewry marrying Jane Mew on 23rd October 1799; in Saint Marylebone, London but with no offspring shown. and a 'Samuel Drury' marrying 'Mary Freeman' on 05 Jul 1790 at Spitalfields,	Christ Church, Stepney, London, again with no offspring. There is also a 'Stuart Drury' who marries 'Mary Cundell', on 29th September 1803 at Saint George The Martyr, Southwark, Surrey, England. Who is the 'Drewry Samuel, Merchant' in the above listing? Did Samuel set up as a merchant in 1997 for a while? Park Street, Westminster is around 15 minutes walk from Welbeck Street. It is curious that, if this is another Samuel, he has not surfaced more in our research. And this is probably Samuel. Size range: Height 3.7 in. / Height 9.5 cm." Artnet.com does not give the date of the auction. It seems likely that this is the same miniature that was sold as one of a pair in 1997. The other miniature in the 1997 auction was of William Drewry of 19 Howland Street - almost certainly William Tillotson, Samuel's son. Engleheart was the nephew of the miniature painter George Engleheart. He entered his uncle's studio at the age of fourteen. He first exhibited at the Royal Academy in 1801, and went on to show a total of 157 works. He was a man of substantial means, and in his time a very popular painter, but his health broke down when he was 44 years old, and he had to relinquish the pursuit of his profession. He lived at Tunbridge Wells for some years and died there in 1862.